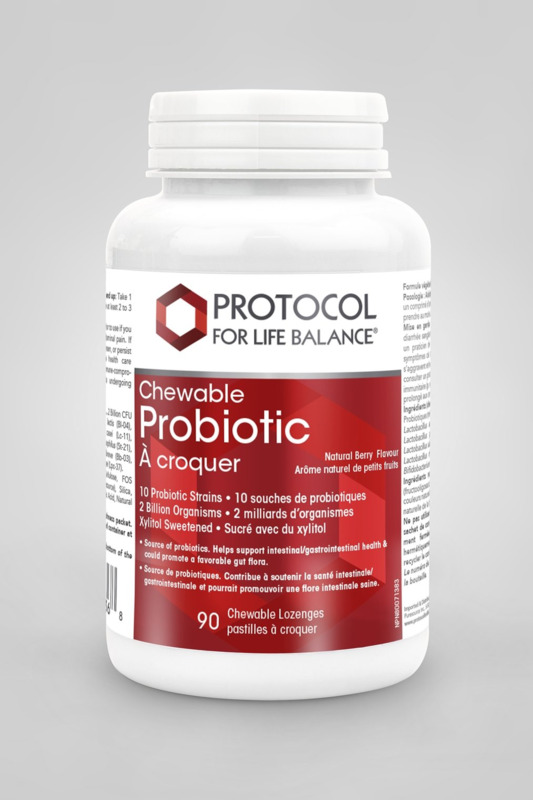 Chewable Probiotic-4™ is a great tasting, chewable probiotic supplement sweetened with xylitol. The bacterial strains in this product have been scientifically tested and chosen for their ability to support healthy immune system and GI functions. * These bacterial strains are particularly hardy and have been shown to adhere to the intestinal lining, thereby helping to maintain intestinal integrity. * In addition, these probiotic bacteria can help to maintain a healthy level of oxalates in the gut. * Chewable Probiotic-4™ can be used by both adults and children. As a dietary supplement for Children (age 2 & up) and Adults: Chew 1 tablet 1 to 6 times daily between meals or on an empty stomach. For children under 2, use only on the advice of your healthcare practitioner. * Percent Daily Values are based on a 2,000 calorie diet . Xylitol, Sorbitol, Cellulose, Stearic Acid (vegetable source), Silica, Natural Berry Flavors, Malic Acid and Beet Powder.